The fifth in William LJ Galaini's Gamer on a Budget review series sees William take a look at the recent PC port of Sid Meier's Ace Patrol. What is this Mars thingy by the way! To think that the sort of people who created these wonderful and brilliantly cut gems of gaming are the same that proclaim the end of all hand-held gaming consoles because, hey, you can play on your mobile phone (oh, and the tablet) is sort of laughable, and that's before you actually take a look at playing with those laggy, completely inaccurate touch controls. It's an iOS port. I haven't seen a single good game* on mobile phones yet. *Disclaimer: By game I do mean something that is a little more complex than Fruit Ninja. Those are fun diversions, but barely anything more. Mobile games are really just something to pass the time while riding public transit or sitting in the waiting room at the doctor's office. Mind you, I have had fun and put hours into things like "Pocket Planes" because there is a certain addictive element to them but really, this was not deserving of a pc port. Joseph wrote: Mobile games are really just something to pass the time while riding public transit or sitting in the waiting room at the doctor's office. My gameboy certainly did that better, 20 years ago. It most likely still does, all things considered. wow. just throw a name on it and hope it sells. wouldn't have played this anyhow but thanks for the warning! and yeah, the breakdowns at the end are great. Fraxis also had an FPS in mind for a while that was supposed to be a more 'twich' based shooter like Rainbow Six. It was announced after Half Life Blueshift came out but canned eventually. Out of all of his canned projects, Dinosaurs was possibly the most interesting for me. I actually had two of the "real" Sid Meier sims. One was called "Solo Flight" and the other was "F15 Strike Eagle". Both bloody brilliant games for their time. 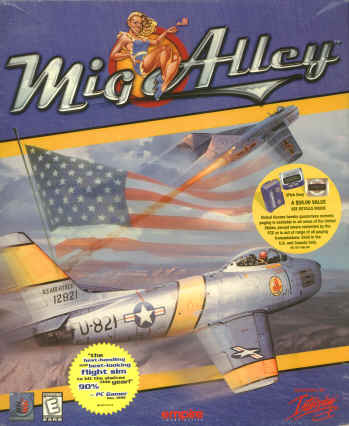 This may look dated Mig Alley Ace but those game mechanics are what people expect from a flight sim with the Sid Meier name associated with them. I loved Sid's Red Baron that would boot you to the DOS prompt if you crashed. See below for a great sim, if you can find it anywhere. wow. they really thought this would be good? i could never be that bored. So.... am I being trolled or does this guy have any valid points? His expectations for the price range are alarmingly narrow. Ten bucks can get you a great game as we've seen on here time and time again. I honestly think he was just trolling me, but I wanted to be sure. I've gotten a number of trolls on the other reviews, but he was the least obvious so I wanted to be sure. I will never understand the basement dwelling internet troll. While I delight in how the internet has given a voice to all.... I sometimes cringe, too. The internet is what it is. People are what they are. It's equally amusing and annoying.